We tend to take the whole digestion process for granted. We sit (or stand) to eat and once the food goes in our mouth we forget about it and after a second we start thinking about the next bite or what happened at work today or what’s happening on TV. As a result most of us aren’t chewing our food properly and we are swallowing large chunks of food expecting the rest of our digestive system to break it down. “Why is it such a big deal?” I hear you ask. 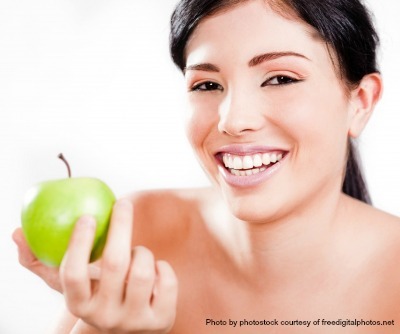 Digestion is one of the essential jobs of the human body and it begins in the mouth. You take a bite and the food enters your mouth and if chewed properly will glide into the esophagus and into the stomach and small intestine. From there the amazing nutrients (vitamins, minerals, antioxidants) will get absorbed and utilised and hopefully 16 – 40 hours later the waste should be coming out of your body in the form of poop. When you chew, you break down your food into smaller pieces by your teeth and saliva is secreted. Within the saliva are enzymes that break down the molecules of your food even more. The more you chew and the more broken down the food gets both mechanically and chemically (from the enzymes), the easier digestion is on the rest of your body. Saliva also helps in swallowing as it lubricates the food so if you are not chewing properly then you will be swallowing large dried pieces of food and the journey through the digestive tract will definitely not be as smooth. As your food breaks down it signals hormones, enzymes and gastric juices to be produced to help in the digestion process further. If we are rushing through meals and only chewing our food a couple of times we are missing this very important step in digestion. Remember our stomach doesn’t have teeth! It doesn’t cost anything to chew and is a simple way to improve your digestive and overall health and chewing alone can eliminate bloating, gas and abdominal pain. So, next time you eat try to be more mindful of your chewing, is the food broken down properly before you swallow? You are not what you eat but what your body can do with what you eat so you could be putting only healthy food into your body but is it able to break down and absorb those nutrients? Combine mushrooms, shallots, oil and 1/4 cup water in a 5- to 6-quart Dutch oven. Cover and cook over high heat, stirring often, until mushrooms are juicy, 3 to 4 minutes. Uncover and cook, stirring often, until the mushrooms are lightly browned, 8 to 10 minutes. Add broth, carrots, thyme and bay leaves; bring to a boil. Place chicken in a 5- to 6-quart slow cooker and lay lemon slices on top. Turn heat to high. Carefully pour in the vegetable mixture. Cover and cook until the chicken is very tender, 3 1/2 to 4 hours. With a slotted spoon, transfer the chicken and vegetables to a bowl; discard bay leaves and lemon slices. Skim fat and pour the juices into a large saucepan; add lemon zest. Bring to a boil over high heat. Boil until reduced to 2 cups, 15 to 20 minutes. Mix cornstarch with remaining 1/4 cup water in a small bowl. Add to the pan and cook, stirring, until slightly thickened. Add cream and lemon juice; stir until boiling. Return the chicken and vegetables to the sauce and heat through. Season with salt and pepper. 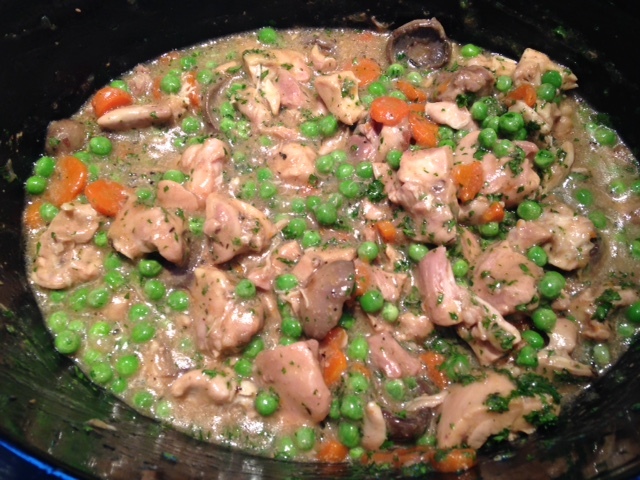 Just before serving, stir in peas and parsley. Bananas Are Bad For Me? Last week I had 5 people ask me if they should be eating bananas because they are high in sugar. I have to admit I’m a little confused by this. Did I miss the memo about bananas being bad for you? Here is my low down on bananas. 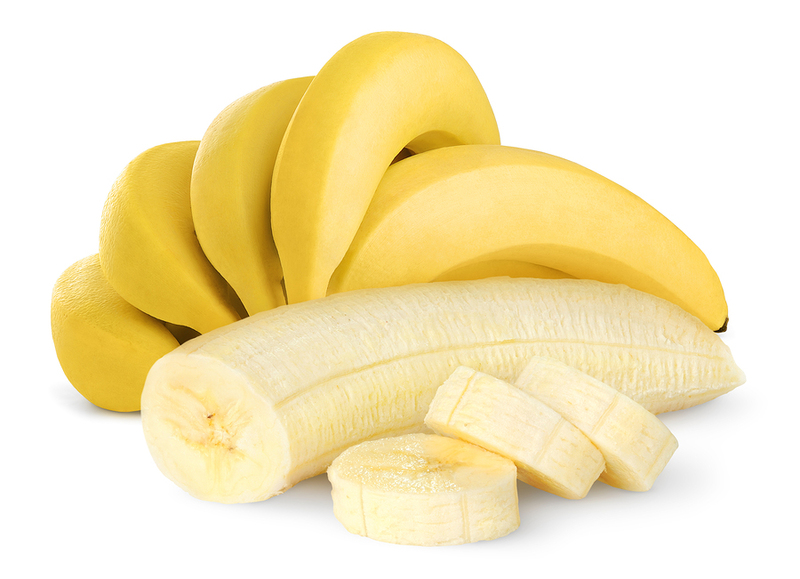 One small banana contains 90 calories, 1mg of sodium, 23 grams of carbs with 3 grams of fiber. The sugars in a banana come in at 12 grams. The sugars in a banana are not added sugars. There is a big difference between added sugars and sugars that naturally occur in fruit. A couple servings of fruit a day is fine! Added sugars are what you need to be careful of. A banana also contains vitamin A, C, folate, choline, calcium, magnesium, phosphorus and a large amount of potassium. Potassium is important for each beat of your heart. It also helps your muscles to move, your nerves to work and your kidneys to filter blood. Bottom line? If you want a banana EAT A BANANA and always choose a whole food over a prepackaged snack. Want to know what your daily limit of added sugar is? Reply to this email and I will give you the amount. Who loves chocolate? Raise your hand. Yep, that’s what I thought…everyone! Chocolate is great, and once in a while a nice piece of dark chocolate or Giddy YoYo is a special treat, but on Valentine’s Day we can all get carried away and forget that one little piece does not make a whole box..
I’ve found some healthy alternatives to the heart-filled box of empty calories that will make you and your sweetheart happy without bouncing off the walls from the overload of sugar. Make it yourself. Everyone loves a home cooked meal, the kind that you sometimes reserve for the weekend because you just don’t have the time during the week. 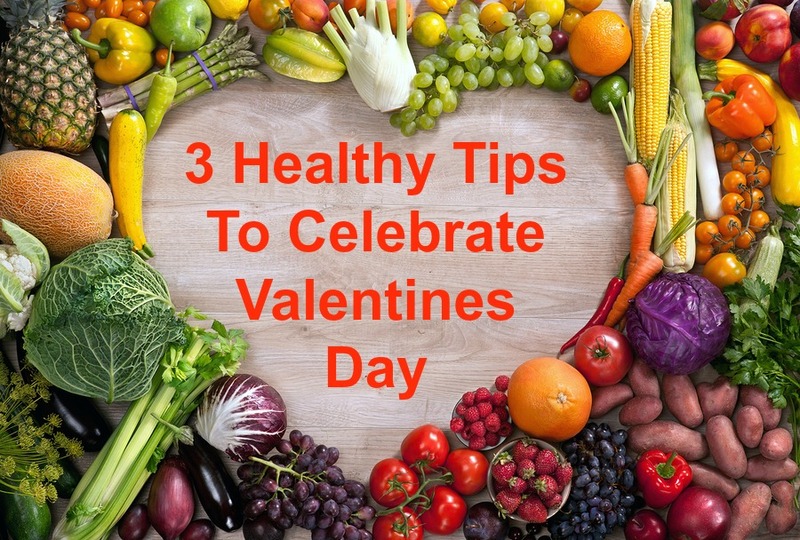 Luckily Valentine’s Day this year falls on Saturday, so if you’re tired you’ll have Sunday to recover. Make a salad to start with lots of healthy veggies, maybe even adding some fruit for sweetness. A lean, grilled protein and a side of oven-roasted sweet potato, asparagus, zucchini and eggplant will definitely be sure to melt your partner’s heart. Go for the gold. Golden yellow pineapple is an amazing treat. It’s sweet and satisfying and can make a beautiful dessert. Buy a whole pineapple, wash it and slice it in 2 lengthwise then carefully cut out the flesh and cube it. Put some of the fruit back into each shell and toss in some raspberries, strawberries and blueberries for a great antioxidant and there you have yourself an easy and delicious dessert that you both can share. Think outside the box. Yes, it’s nice to receive a pretty red heart shaped box of sweets, but what about the day after, when you’ve come down from your sugar high, you feel crappy and guilty and you know that there was a better way to go. Well here it is. If you feel like you really need a treat to celebrate the day, then go ahead and make these sweet and tart squares below and box them up with a ribbon and give them as a gift to yourself or your better half! Your waistline will thank you. Blend oats, flour, baking soda, cinnamon, yogurt, milk, apple sauce and egg. Toss raspberries with cornstarch and stir in. Inflammation is at the root cause of many chronic health problems, conditions like heart disease, obesity, diabetes, depression and even autism. It’s the number one reason that people consult any health care practitioner. Allergies, arthritis, Crohn’s, colitis and autoimmune diseases are just some of the common inflammatory conditions. It’s an immune response to physical injury, exposure to environmental toxins, allergies or infection and can cause pain, redness, heat and swelling in the affected area. If it sticks around for long periods of time, inflammation can lead to disease. Studies show that chronic inflammation appears to increase the likelihood of development of several different cancers. If you have any of the above triggers in your diet and lifestyle then you are probably suffering from some form of inflammation. To reduce this, try including some or all of my top 5 anti-inflammatory foods in your diet. 1. Omega 3 Fats – These are at the top of my list for foods to go to when dealing with inflammation. Omega 3’s help reduce inflammation throughout the body so include foods like hemp, chia, flax, walnuts, sardines and fresh or frozen wild caught salmon or canned sockeye salmon in your diet. Check out the website www.seachoice.org to help you make a sustainable choice of seafood. You can also take a fish oil supplement, look for products that provide both EPA and DHA, in a daily dosage of two to three grams. 2. Turmeric is a bright orange root that contains a compound called curcumin. Curcumin is an antioxidant that protects cells from free radical damage. It also lowers histamine levels in the body which helps to reduce inflammation. 3. Ginger contains very potent anti-inflammatory compounds called gingerols and it blocks the formation of inflammatory compounds and also has antioxidant effects that break down existing inflammation and acidity in the fluid within the joints. Check out my carrot, apple ginger soup recipe at the end of this post. 4. Cruciferous Veggies are also known as the brassica family of vegetables and include cabbage, broccoli, cauliflower, garlic and onions and are high in antioxidants that not only reduce inflammation but also fight cancer. 5. Fermented Foods like kimchi, sauerkraut and kombucha contain probiotics that help to support your immune system and fight inflammation. Preheat oven to 400°F. Combine carrots, parsnips, apples, olive oil, salt and pepper. Toss well to coat. Spread in a single layer on a rimmed baking sheet. Roast for 12 to 15 minutes, until soft and browned. Transfer to a large saucepan and cover with broth and water. Bring to a boil, then reduce to a simmer. Stir in ginger and cook for 8 to 10 minutes longer. Remove from heat and cool slightly. Blend until smooth, using a regular blender or an immersion blender. Season to taste with salt and pepper.